Cage bars should be narrow enough to keep out paws. The fact is, some cats get along with parakeets, but by nature cats see birds as little other than airborne meals. You can experiment with introducing a pet bird to a pet cat, and they may even get along. But the risks may not be worth the potential reward. When your bird is behind bars, your cat may see him as a snack in a trap. While you could theoretically keep a bird confined to a separate room than those the cat's allowed to inhabit, both cats and parakeets are frequently social creatures who enjoy the company of their owners -- locking either one away may leave him lonely, and isolation is bad for birds. In case they don't get along, make sure your cage is heavy, high and designed with bars that your cat's paw won't fit through. If the cat can get close to the cage, it could leave your bird a nervous wreck. Place it high up and away from any shelves that the cat could access. Depending on your cat's hunting and playing instincts, he may or may not be predisposed to roughhousing your bird or worse. The only way to be sure is to allow the two of them to interact with each other out in the open, which poses a rather obvious risk to your bird. Kittens may be more willing to get along with parakeets, because they aren't as instinctively inclined to attack them -- though they may accidentally play rougher than a bird can handle. While your cat and your parakeet may appear to get along, you should nevertheless monitor their every interaction carefully. Your cat is significantly bigger and stronger than your bird -- one well-intentioned, playful swat could have deadly consequences. Even if your cat doesn't accidentally harm your bird with a pounce or a swipe, the bacteria he carries could infect your parakeet if he attacks. That bacteria can infect the type of open wound created by a scratch or a bite, and a parakeet's immune system is not necessarily strong enough to effectively stave off a serious infection. If your cat is acting excitable around the bird, cut the visitation short, and if he lands a blow, contact your avian vet. If your cat won't suppress his urge to hiss at, attack and/or devour your bird, the solution isn't to keep the parakeet in his cage at all times. Parakeets need to spend time outside of their cages, and when they do, you should minimize the environmental risks around the house -- including your cat's presence. This is especially critical if your bird has had his wings clipped, leaving him able to glide while restricting his ability to stay airborne. When you take your parakeet out of his cage for together time, make sure your cat is in another room or at least taking a nap. 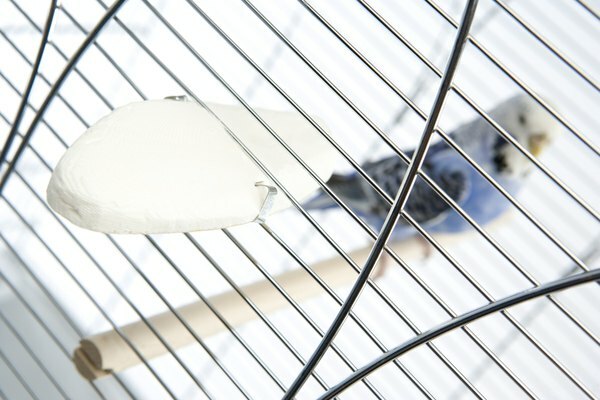 Avian Web: Training Your Dog and Cat to Be Around Your Pet Birds - SAFELY! Do Mollies and Guppies Get Along? Can a Parakeet & a Cat Live Together?